As if looking through the eyes of God, I have seen the beauty of the Arctic Refuge from the vantage of a small airplane. More importantly, I came to know this place from the Gwich’in way of life on what they call the Sacred Place Where Life Begins. For ten years, it was my honor and joy as the bishop of Alaska to be close to the Sacred Place and the life it made possible. Since that time, many of my perceptions of and hopes for this world come from this Land. This is a place where you can see humanity’s beginnings and the essential living relationship that God has given us with the Land. Here, you realize the close connection between creation and human beings, their community, and their culture. Through this lens, we understand the intimate embrace of the Land and human rights—a connection recognized internationally in the United Nations Declaration on the Rights of Indigenous Peoples. You can see humanity’s beginning, but you can also see our present peril. People cannot understand the issue of oil exploration in the Refuge as a human rights issue because they cannot imagine the living relationship between the Gwich’in and the Land. This degraded perception is related to the deeper problem of understanding the living relationship of all peoples to the Land—the environment in which God has placed us. The Land shapes us, our imagination, and our capacity for the fullness of life. We are human because of the Land, a prophetic truth told by the Gwich’in and the Refuge. So we could also say that through the Arctic Refuge we see the sacred destiny and goal of human life—we see our beginning and our future. Let us be hopeful but committed to these truths, to the lessons of the Sacred Place Where Life Begins. 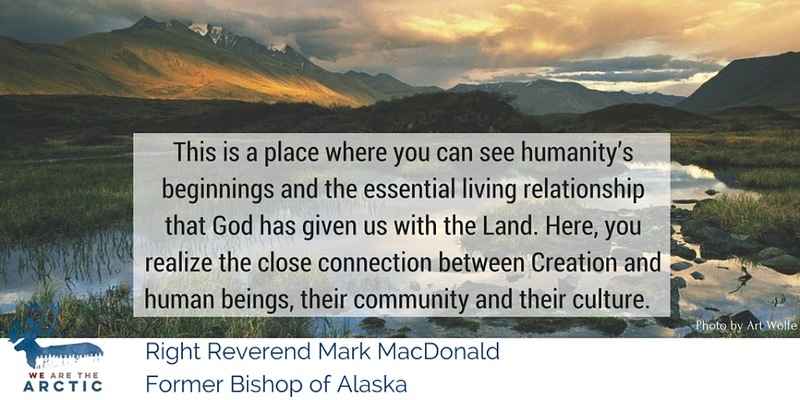 The Right Revered Mark MacDonald was the seventh bishop of the Episcopal Diocese of Alaska; he is now the National Indigenous Anglican Bishop of Canada and the North American president of the World Council of Churches.